A Swedish independent state emerged during the 12th and 13th Century. After the Black Death in the middle of the 14th Century, which hit Scandinavia just as hard as in most other parts of Europe, killing about a third of the population, did the Hanseatic League threaten the whole of Scandinavia's culture, finances and languages. This led to the forming of the Scandinavian Kalmar Union in the end of the 14th Century. But with the union followed other problems and in the 1520s did Sweden leave this union. With the Swedish involvement in the Thirty Years War, on the Reformist side, began an expansion of its territories. And the Swedish Empire was formed. This became one of the great powers of Europe until the early 18th century. Swedish territories outside the Scandinavian Peninsula were gradually lost during the 18th and 19th centuries, ending with the annexation of present-day Finland by Russia in 1809. The last war in which Sweden was directly involved was in 1814, when Norway was militarily forced into personal union. Since then, Sweden has been at peace, maintaining an official policy of neutrality in foreign affairs. The union with Norway was peacefully dissolved in 1905, leading to Sweden's current borders. Though Sweden was formally neutral through both world wars, Sweden engaged in humanitarian efforts, such as taking in refugees from German-occupied Europe. Sweden ( SWEE-dən; Swedish: Sverige [ˈsværjɛ] listen ), is officially called the Kingdom of Sweden (Swedish: Konungariket Sverige ). Sweden's prehistory begins in the Allerød oscillation, a warm period around 12,000 BC, with Late Palaeolithic reindeer-hunting camps of the Bromme culture at the edge of the ice in what is now the country's southernmost province, Scania. This period was characterised by small bands of hunter-gatherer-fishers using flint technology. Sweden is first described in a written source in Germania by Tacitus in 98 AD. In Germania 44 and 45 he mentions the Swedes (Suiones) as a powerful tribe (distinguished not merely for their arms and men, but for their powerful fleets) with ships that had a prow at each end (longships). Which kings (kuningaz) ruled these Suiones is unknown, but Norse mythology presents a long line of legendary and semi-legendary kings going back to the last centuries BC. As for literacy in Sweden itself, the runic script was in use among the south Scandinavian elite by at least the 2nd century AD, but all that has come down to the present from the Roman Period is curt inscriptions on artefacts, mainly of male names, demonstrating that the people of south Scandinavia spoke Proto-Norse at the time, a language ancestral to Swedish and other North Germanic languages. In the 6th century Jordanes names two tribes living in Scandza, both of which are now considered to be synonymous with the Swedes: the Suetidi and Suehans. Suetidi is considered to be the Latin form of Svíþjóð, the Old Norse name for the Swedes. Jordanes describes the Suetidi and Dani as being of the same stock and the tallest of people. He later mentions other Scandinavian tribes as being of a same stature. The Suehans were known to the Roman world as suppliers of black fox skins and, according to Jordanes, had very fine horses, similar to those of the Thyringi of Germania (alia vero gens ibi moratur Suehans, quae velud Thyringi equis utuntur eximiis). The Icelandic historian Snorri Sturluson also wrote that the Swedish king Adils (Eadgils) had the finest horses of his day. It is not known when and how the kingdom of Sweden was born, but the list of Swedish monarchs is drawn from the first kings known to have ruled both Svealand (Sweden) and Götaland (Gothia) as one province, beginning with Eric the Victorious. Sweden and Gothia were two separate nations long before that into antiquity. It is not known how long they existed: the epic poem Beowulf describes semi-legendary Swedish-Geatish wars in the 6th century. "Götaland" in this sense mainly includes the provinces of Östergötland (East Gothia) and Västergötland (West Gothia). The island of Gotland was disputed by other than Swedes, at this time (Danish, Hanseatic, and Gotland-domestic). Småland was at that time of little interest to anyone due to the deep pine forests, and only the city of Kalmar with its castle was of importance. The south-west parts of the Scandinavian peninsula consisted of three Danish provinces (Scania, Blekinge and Halland). North of Halland Denmark had a direct border to Norway and its province Bohuslän. But there were Swedish settlements in south-west Finland, and along the southern coastline of Norrland. St. Ansgar is usually credited with introducing Christianity in 829, but the new religion did not begin to fully replace paganism until the 12th century. During the 11th century, Christianity became the most prevalent religion, and from 1050 Sweden is counted as a Christian nation. The period between 1100 and 1400 was characterised by internal power struggles and competition among the Nordic kingdoms. In the years 1150–1293 according to the legend of Eric IX and the Eric Chronicles and Swedish kings made first, second and third crusade to pagan Finland against Finns, Tavastians and Karelians and started conflicts with the Rus with who no longer had any connection with Sweden. The Swedish colonisation of the coastal areas of Finland started at the same time in 12th and 13th century. 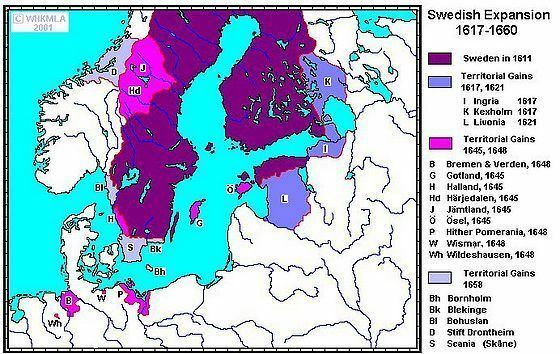 In 14th century Swedish colonisation of coastal areas of Finland began to be more organised and in the end of the century several of the coastal areas of Finland were inhabitet mostly by Swedes. Except for the provinces of Scania, Blekinge and Halland, in the south-west of the Scandinavian peninsula which were parts of the Kingdom of Denmark during this time, feudalism never developed in Sweden as it did in the rest of Europe. The peasantry therefore remained largely a class of free farmers throughout most of Swedish history. 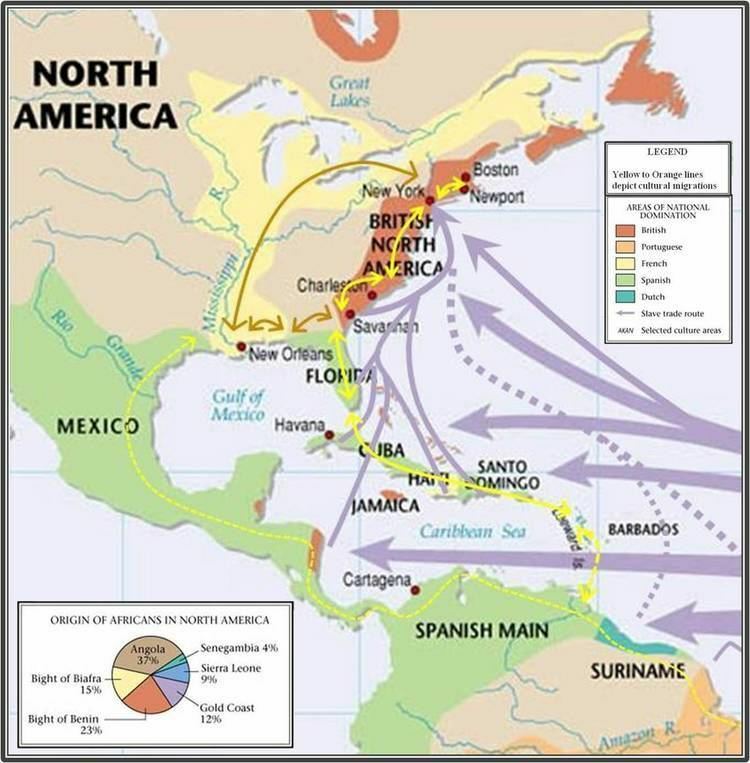 Slavery (also called thralldom) was not common in Sweden, and what slavery there was tended to be driven out of existence by the spread of Christianity, the difficulty in obtaining slaves from the lands east of the Baltic Sea, and by the development of cities before the 16th century. Indeed, both slavery and serfdom were abolished altogether by a decree of King Magnus IV in 1335. Former slaves tended to be absorbed into the peasantry, and some became labourers in the towns. Still, Sweden remained a poor and economically backward country in which barter was the means of exchange. 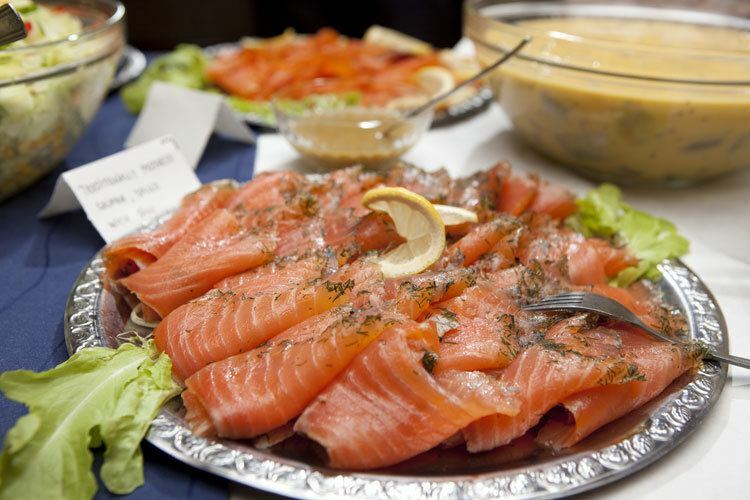 For instance, the farmers of the province of Dalsland would transport their butter to the mining districts of Sweden and exchange it there for iron, which they would then take to the coast and trade for fish, which they consumed, while the iron would be shipped abroad. In the middle of the 14th century, Sweden was struck by the Black Death. The population of Sweden and most of Europe was seriously decimated. And the population (at same territory) as existed by 1348 did not reach the same numbers again until the beginning of the 19th century. One third of the population died during 1349–1351. During this period, the Swedish cities began to acquire greater rights and were strongly influenced by German merchants of the Hanseatic League, active especially at Visby. In 1319, Sweden and Norway were united under King Magnus Eriksson, and in 1397 Queen Margaret I of Denmark effected the personal union of Sweden, Norway, and Denmark through the Kalmar Union. However, Margaret's successors, whose rule was also centred in Denmark, were unable to control the Swedish nobility. A large number of children inherited the Swedish crown over the course of the kingdom's existence; consequently real power was held for long periods by regents (notably those of the Sture family) chosen by the Swedish parliament. King Christian II of Denmark, who asserted his claim to Sweden by force of arms, ordered a massacre in 1520 of Swedish nobles in Stockholm. This came to be known as the "Stockholm blood bath" and stirred the Swedish nobility to new resistance and, on 6 June (now Sweden's national holiday) in 1523, they made Gustav Vasa their king. This is sometimes considered as the foundation of modern Sweden. Shortly afterwards he rejected Catholicism and led Sweden into the Protestant Reformation. The Hanseatic League had been officially formed at Lübeck on the Baltic coast of Northern Germany in 1356. The Hanseatic League sought civil and commercial privileges from the princes and royalty of the countries and cities along the coasts of the Baltic Sea. In exchange, they offered a certain amount of protection. Having their own navy, the Hansa were able to sweep the Baltic Sea free of pirates. The privileges obtained by the Hansa included assurances that only Hansa citizens would be allowed to trade from the ports where they were located. They sought agreement to be free of all customs and taxes. With these concessions, Lübeck merchants flocked to Stockholm, where they soon came to dominate the city's economic life and made the port city of Stockholm into the leading commercial and industrial city of Sweden. 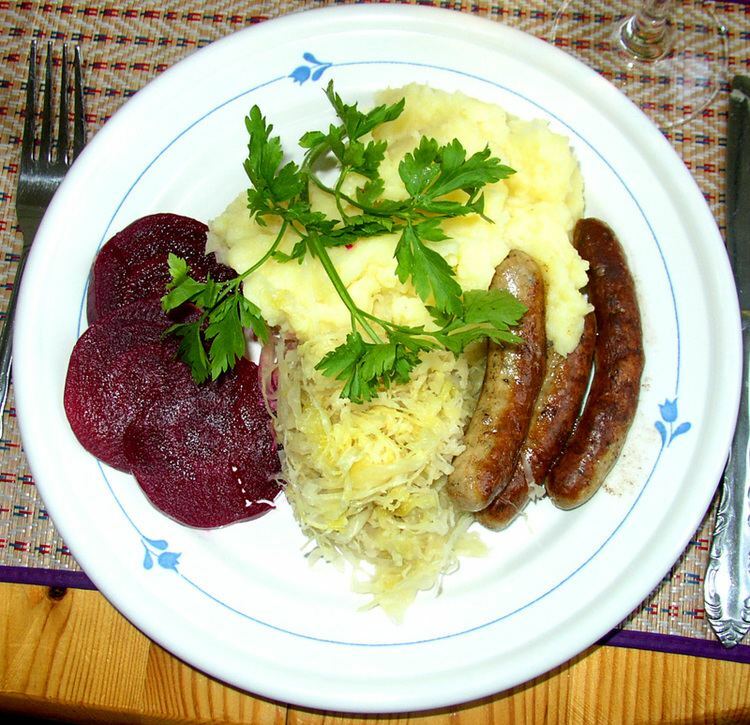 Under the Hanseatic trade, two-thirds of Stockholm's imports consisted of textiles and one-third of salt. The main exports from Sweden were iron and copper. Sweden was officially neutral during World War I, although, under German pressure, they did take steps which were detrimental to the Allied powers including mining the Øresund channel, thus closing it to Allied shipping, and allowing the Germans to use Swedish facilities and the Swedish cipher to transmit secret messages to their overseas embassies. Sweden also allowed volunteers fighting for the White Guards together with the Germans against the Reds and Russians in the Finnish Civil War, and briefly occupied the Aland islands in co-operation with Germany. As in the first world war, Sweden remained officially neutral during World War II, although its neutrality during World War II has been disputed. Sweden was under German influence for much of the war, as ties to the rest of the world were cut off through blockades. The Swedish government felt that it was in no position to openly contest Germany, and therefore made some concessions. Sweden also supplied steel and machined parts to Germany throughout the war. However, Sweden supported Norwegian resistance, and in 1943 helped rescue Danish Jews from deportation to Nazi concentration camps. The Swedish government also unofficially supported Finland in the Winter War and the Continuation War by allowing volunteers and materiel to be shipped to Finland. In 2014 Stefan Löfven won the General Election and became the new Swedish Prime Minister. The Sweden Democrats held the balance of power and voted the government's budget down in the Riksdag, but due to agreements between the government and the Alliance, the government was able to hang onto power. Sweden was heavily affected by the 2015 European migrant crisis, eventually forcing the government to tighten regulations of entry to the country, as Sweden received thousands of asylum seekers and migrants predominantly from Africa and the Middle East per week in autumn, overwhelming existing structures. 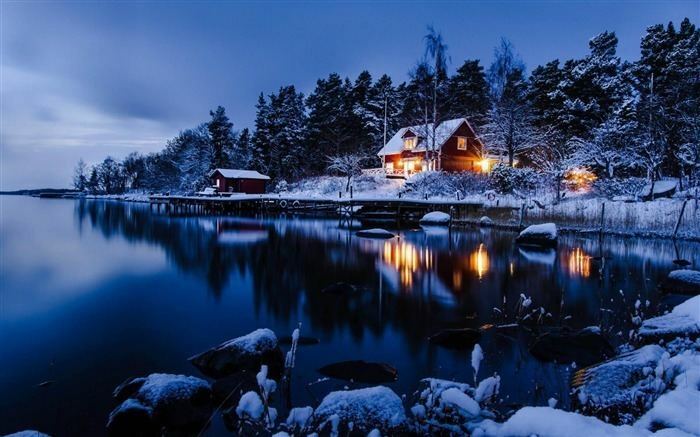 Sweden has 25 provinces or landskap (landscapes), based on culture, geography and history. While these provinces serve no political or administrative purpose, they play an important role in people's self-identity. The provinces are usually grouped together in three large lands, parts, the northern Norrland, the central Svealand and southern Götaland. The sparsely populated Norrland encompasses almost 60% of the country. 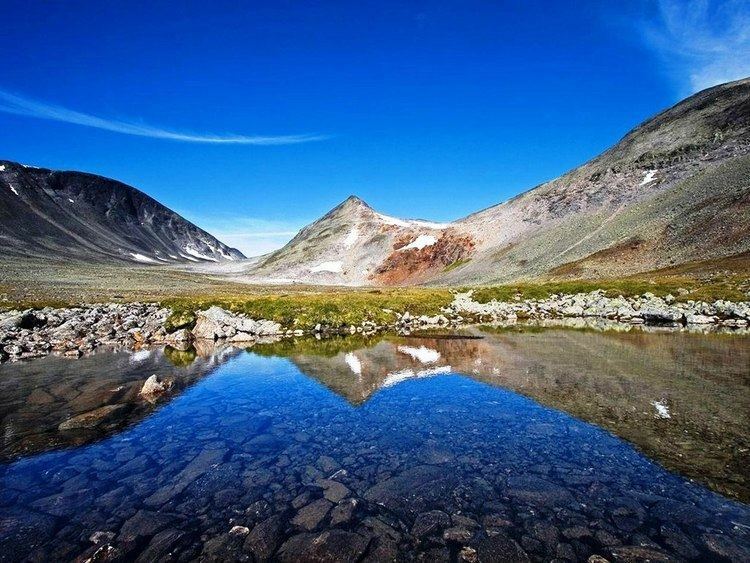 Sweden also has the Vindelfjällen Nature Reserve, one of the largest protected areas in Europe, totaling 562,772 ha (approx. 5,628 km2). The public sector in Sweden is divided into two parts: the legal person known as the State (Swedish: staten) and local authorities: the latter includes regional County Councils (Swedish: landsting) and local Municipalities (Swedish: kommuner). The local authorities, rather than the State, make up the larger part of the public sector in Sweden. County Councils and Municipalities are independent of one another, the former merely covers a larger geographical area than the latter. The local authorities have self-rule, as mandated by the Constitution, and their own tax base. Notwithstanding their self-rule, local authorities are nevertheless in practice interdependent upon the State, as the parameters of their responsibilities and the extent of their jurisdiction is specified in the Local Government Act (Swedish: Kommunallagen) passed by the Riksdag. On 27 October 1981, a Whiskey-class submarine (U 137) from the Soviet Union ran aground close to the naval base at Karlskrona in the southern part of the country. Research has never clearly established whether the submarine ended up on the shoals through a navigational mistake or if an enemy committed espionage against Swedish military potential. The incident triggered a diplomatic crisis between Sweden and the Soviet Union. The 1986 assassination of Olof Palme and with the end of the Cold War, Sweden has adopted a more traditional foreign policy approach. Nevertheless, the country remains active in peace keeping missions and maintains a considerable foreign aid budget. The typical worker receives 40% of his or her labour costs after the tax wedge. Total tax collected by Sweden as a percentage of its GDP peaked at 52.3% in 1990. The country faced a real estate and banking crisis in 1990–1991, and consequently passed tax reforms in 1991 to implement tax rate cuts and tax base broadening over time. Since 1990, taxes as a percentage of GDP collected by Sweden has been dropping, with total tax rates for the highest income earners dropping the most. In 2010 45.8% of the country's GDP was collected as taxes, the second highest among OECD countries, and nearly double the percentage in the US or South Korea. Tax income-financed employment represents a third of the Swedish workforce, a substantially higher proportion than in most other countries. Overall, GDP growth has been fast since reforms—especially those in manufacturing—were enacted in the early 1990s. In 2007, total tax revenue was 47.8% of GDP, the second-highest tax burden among developed countries, down from 49.1% 2006. Sweden's inverted tax wedge – the amount going to the service worker's wallet – is approximately 15%, compared to 10% in Belgium, 30% in Ireland, and 50% in United States. Public sector spending amounts to 53% of the GDP. State and municipal employees total around a third of the workforce, much more than in most Western countries. Only Denmark has a larger public sector (38% of Danish workforce). Spending on transfers is also high. Swedish inventors held 47,112 patents in the United States in 2014, according to the United States Patent and Trademark Office. As a nation, only ten other countries hold more patents than Sweden. The total resident population of Sweden was 10,042,928 on 31 May 2017. The population exceeded 9 million for the first time on approximately 12 August 2004 and 9.5 million in the spring of 2012, according to Statistics Sweden. The population density is 20.6 people per km² (53.3 per square mile) and it is substantially higher in the south than in the north. About 85% of the population live in urban areas. The capital city Stockholm has a municipal population of about 900,000 (with 1.3 million in the urban area and 2 million in the metropolitan area). The second- and third-largest cities are Gothenburg and Malmö. Greater Gothenburg counts close to a million inhabitants and the same goes for the western part of Scania, around the Öresund. Together with Greater Copenhagen, the entire population around the Öresund counts close to 3 million in a land area of less than 6,000 square kilometres (2,300 sq mi). Outside of major cities, areas with notably higher population density include the agricultural part of Östergötland, the western coast, the area around Lake Mälaren and the agricultural area around Uppsala. There are no official statistics on ethnicity, but according to Statistics Sweden, around 3,060,115 (30.6%) inhabitants of Sweden were of a foreign background in 2016, defined as being born abroad or born in Sweden with at least one parent born abroad. The most common countries of origin were Finland (1.53%), Syria (1.49%), Iraq (1.35%), Poland (0.89%) and Iran (0.71%). The official language of Sweden is Swedish, a North Germanic language, related and very similar to Danish and Norwegian, but differing in pronunciation and orthography. Norwegians have little difficulty understanding Swedish, and Danes can also understand it, with slightly more difficulty than the Norwegians. The same goes for standard Swedish speakers, who find it far easier to understand Norwegian than Danish. The dialects spoken in Scania, the southernmost part of the country, are influenced by Danish because the region traditionally was a part of Denmark and is nowadays situated closely to it. Sweden Finns are Sweden's largest linguistic minority, comprising about 5% of Sweden's population, and Finnish is recognised as a minority language. With a large influx of native speakers of Arabic in latter years, the prevalence of native Arab speakers is likely more widespread than actual usage of Finnish. The actual number is unknown, since no official statistics are kept. Along with Finnish, four other minority languages are also recognised: Meänkieli, Sami, Romani, and Yiddish. Swedish became Sweden's official language on 1 July 2009, when a new language law was implemented. 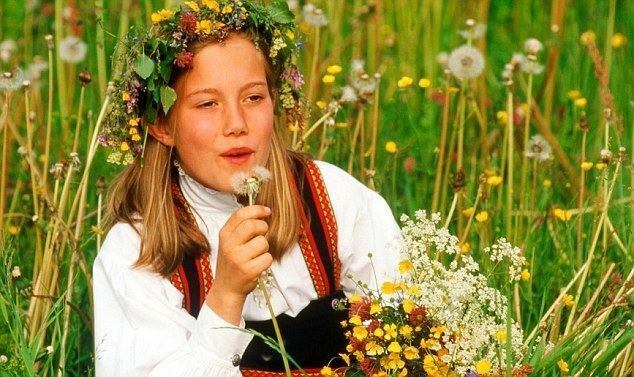 The issue of whether Swedish should be declared the official language has been raised in the past, and the Riksdag voted on the matter in 2005, but the proposal narrowly failed. Before the 11th century, Swedes adhered to Norse paganism, worshiping Æsir gods, with its centre at the Temple in Uppsala. With Christianisation in the 11th century, the laws of the country changed, forbidding worship of other deities into the late 19th century. After the Protestant Reformation in the 1530s, a change led by Martin Luther's Swedish associate Olaus Petri, the authority of the Roman Catholic Church was abolished and Lutheranism became widespread. Adoption of Lutheranism was completed by the Uppsala Synod of 1593, and it became the official religion. During the era following the Reformation, usually known as the period of Lutheran orthodoxy, small groups of non-Lutherans, especially Calvinist Dutchmen, the Moravian Church and French Huguenots played a significant role in trade and industry, and were quietly tolerated as long as they kept a low religious profile. The Sami originally had their own shamanistic religion, but they converted to Lutheranism by Swedish missionaries in the 17th and 18th centuries. At the end of 2016, 61.2% of Swedes belonged to the Church of Sweden; this number has been decreasing by about 1.5 percentage points a year for the last 5 years and one percentage point a year on average for the last two decades. Approximately 2% of the church's members regularly attend Sunday services. The reason for the large number of inactive members is partly that, until 1996, children automatically became members at birth if at least one of the parents was a member. Since 1996, only children that are christened become members. Some 275,000 Swedes are today members of various Evangelical Protestant free churches (where congregation attendance is much higher), and immigration caused that there are now some 92,000 Roman Catholics and 100,000 Eastern Orthodox Christians living in Sweden. Sociology professor Phil Zuckerman claims that Swedes, despite a lack of belief in God, commonly question the term atheist, preferring to call themselves Christians while being content with remaining in the Church of Sweden. Other research has shown that religion in Sweden continues to play a role in cultural identity. This is evidenced by the fact that around 70% of adults continue to remain members of the Swedish Church despite having to pay a church tax; moreover, rates of baptism remain high and church weddings are increasing. Around 27% or 2,000,000 inhabitants of Sweden had a full or partial foreign background in 2011. Of these inhabitants, 1,427,296 persons living in Sweden were born abroad. In addition, 430,253 persons were born in Sweden to two parents born abroad and another 666,723 persons had one parent born abroad (with the other parent born in Sweden). Thus, with the total population in 2011 being 9,482,855, roughly 15% of the population was born abroad, 4.5% of the population was born in Sweden to two parents born abroad, and another 7% was born in Sweden to one parent born abroad. Around 26.5% of the Swedish population is, at least partly, of foreign descent. Throughout the 1960s and 1970s Sweden was seen as an international leader in what is now referred to as the "sexual revolution", with gender equality having particularly been promoted. At the present time, the number of single people is one of the highest in the world. The early Swedish film I Am Curious (Yellow) (1967) reflected a liberal view of sexuality, including scenes of love making that caught international attention, and introduced the concept of the "Swedish sin" that had been introduced earlier in the US with Ingmar Bergman's Summer with Monika. 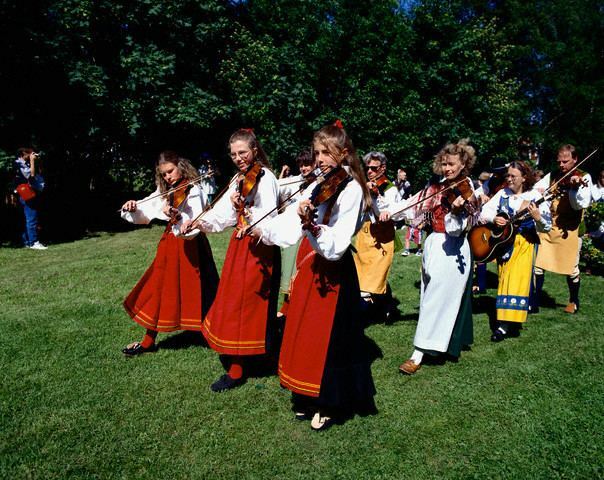 Sweden has a rich musical tradition, ranging from mediaeval folk ballads to hip hop music. The music of the pre-Christian Norse has been lost to history, although historical re-creations have been attempted based on instruments found in Viking sites. The instruments used were the lur (a sort of trumpet), simple string instruments, wooden flutes and drums. It is possible that the Viking musical legacy lives on in some of the old Swedish folk music. Sweden has a significant folk-music scene, both in the traditional style as well as more modern interpretations which often mix in elements of rock and jazz. There is also Sami music, called the joik, which is actually a type of chant which is part of the traditional Saami animistic spirituality but has gained recognition in the international world of folk music. Sweden's most classic and notable composers includes Carl Michael Bellman and Franz Berwald. In 2007, with over 800 million dollars in revenue, Sweden was the third-largest music exporter in the world and surpassed only by the US and the UK. According to one source 2013, Sweden produces the most chart hits per capita in the world, followed by the UK and the USA. ABBA was one of the first internationally well known popular music bands from Sweden, and still ranks among the most prominent bands in the world, with about 370 million records sold. With ABBA, Sweden entered into a new era, in which Swedish pop music gained international prominence. Sport activities are a national movement with half of the population actively participating in organised sporting activities. The two main spectator sports are football and ice hockey. Second to football, horse sports have the highest number of practitioners who are mostly women. Thereafter, golf, track and field, and the team sports of handball, floorball, basketball and bandy are the most popular.